Posted by Cyril. April 7th 2017. Pet car safety is just as important as it is for people. For many pets, a car journey is like an adventure. It can lead to fun days out, new places to explore and visits to family, though occasionally also *gulp* a trip to the vet. However, owners must take care when transporting their pets in the car. What are the guidelines on pet car safety? The Highway Code states that all pets must be adequately restrained using a harness or crate during car transportation. Ignoring this could result in serious injury or breaches of the law including ‘driving without due care and attention’, so it’s important to bear this in mind before hitting the road. We have some advice on car safety for pets so you can make every car journey a smooth, safe ride for everybody. Most dogs are excited at the prospect of going out in the car, but others aren’t so confident. 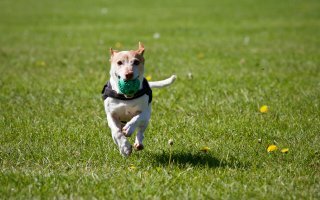 If your dog isn’t properly secure, their excitability or panic could make even the shortest journey dangerous. A dog loose in the car can easily cause a distraction and lead to an accident. Remember, having loose pets in the car is dangerous and can result in a breach of the law. This means no more dogs sticking their heads out of the window; sorry about that. If you have a hatchback, estate or 4×4 vehicle with boot space, this is the safest place for a dog. Putting up a guardrail will stop them jumping over into the main car space, while still allowing you to see each other, giving you the best of both worlds. If your boot space isn’t suitable, a good quality seat belt harness is a secure alternative. 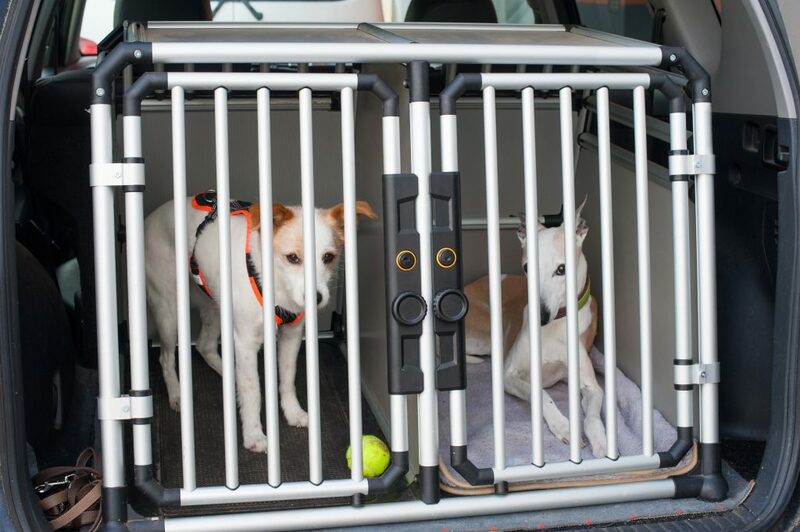 Some dogs prefer a crate, which keeps them confined and feeling safe if they’re nervous about travelling. The crate can also be covered with a sheet if they’re especially nervous or have travel sickness, and can be strapped into the car to keep it securely in place. Insurance for dogs is also an essential investment for ensuring they’re well cared for in the event of an accident, and also helps you avoid those high vet fees. Cats aren’t as easily pleased as dogs. A trip in the car can be a stressful event unless they’re transported regularly. A loose cat in the car could spell disaster; cats are quicker, able to get into smaller spaces or in the way of the pedals. Keeping your cat in a securely closed carrier secured by a seatbelt is the most responsible way to travel. This prevents escapes and keeps the carrier from moving or falling off the seat in an abrupt stop. The carrier can be strapped into the rear seat belt or can be placed in the boot of a hatchback or estate car, providing it is adequately tied down. You should also place something absorbent in the carrier, like paper or soft bedding, to soak up any accidents along the way; these are quite common with nervous cats that aren’t used to travelling. Accidents do, unfortunately, happen from time to time, so pet insurance for cats is something you should invest in from day one. If they do get injured out and about, this will ensure they’re well cared for. Remember, your pet has a fur coat on. Make sure your car is a steady temperature and they have plenty of water to stay hydrated. You should also never leave your pet alone in the car. A car can reach 40 degrees in 30 minutes, even on a day that seems cool. If the sun is shining through the window, it can feel like a magnifying glass on your beloved pet, causing heat stroke or worse. The same applies to the cold. A fur coat doesn’t mean your pet is always warm, and sitting still in a cold car can be very uncomfortable for them. Make sure your pets have adequate blankets or coats for car journeys during the colder months. Pets can get travel sickness just like we can. This is usually caused by the motion of the car or from seeing the world pass by at speed. You can usually tell straight away if your pet is nauseous, as they tend to start drooling or licking their lips. Avoid feeding your pet at least 2 hours before travelling. This will reduce the amount of food in their stomach and, hopefully, reduce the chance of them being sick. Motion-related sickness is a tough one to combat but, when possible, try and keep the drive as smooth as possible and avoid taking corners at speed. You can also drape a sheet or blanket over their pet carrier so they can’t see the world passing by, which can help prevent sickness in some cases. In more extreme cases, symptoms can be relieved with medication. Your vet can make recommendations for the most suitable medication for your pet. Unfortunately, some pets are going to get travel sickness no matter what. Be prepared and stock your car with plenty of water and cleaning products. While considering car safety for pets is sensible, it’s also a legal requirement. Pets get travel sickness too; it isn’t just people. Make sure you have something to mop up any mess. On the topic of mess, accidents happen. Make sure you make regular toilet stops for your pet, or you may have a smelly trip! If you’re uncomfortable with the condition in the car, then your pet will be too. Never leave your pet in a hot car for any length of time. Leave them at home where they’ll be more comfortable. As well as making sure they’re safe in your car, you should also have pet insurance to make sure they’ll get the best care if an accident were to happen. Visit our main site at www.argospetinsurance.co.uk for more information about our dog insurance and cat insurance policies.